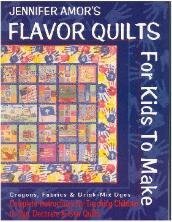 Flavor Quilts for Kids to Make: Crayons, Fabrics & Drink-Mix Dyes. Complete instructions for teaching children to dye, decorate & sew quilts, by Jennifer Amor. This ground-breaking book based on the author's years of experience conducting school residencies has easy to follow instructions for fabric crayons, paints, powdered soft drink mix dyes and teaching children to sew by hand. Basic quiltmaking for non-quilters, lesson plans and reading lists included. Currently out of print, the book is available only from the author. Supplies limited. Soft cover, 100 pages.